Consult your favorite search engine's news section and you will find an increasing number of stories about everyone's (least) favorite double wood situation. Cities are now openly "tired of double utility poles" and note that they are a "serious hazard," and local journalists are finding they "spark complaints from homeowners." If all of these sound bytes point to anything, it is likely this: cities and communities are paying closer, more meticulous attention to the health and safety of their infrastructure, and as a result, joint use departments must step up their attention to infrastructure asset management—especially double pole removal. Why should you start dealing with neglected pole transfers today? 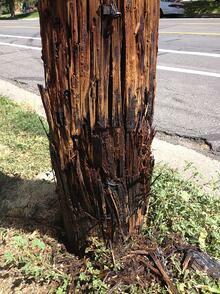 One reason: double utility poles can be hazards—visible dangers begging for remedy. Because safety comes first—in all things, but especially in infrastructure asset management. Here are a few reasons leaving old poles behind can be dangerous to the people that pass by daily. Utility poles take up scarce roadside real estate, especially in urban areas. One pole is acceptable when space is tight. However, two structures occupying a scant few feet of ground that would ordinarily only be suited to one can create obstructed views for drivers. Imagine pulling up to a corner and attempting a turn. Look to your right and all you see is double wood, rather than oncoming cars. That split-second need to look around and choose to accelerate or wait can turn into a close call or worse. Double utility poles happen in some cases when a larger or newer pole replaces an older or smaller pole. Attachments may have even been moved (although in many cases at least one remains), but the structure still stands. When poles are decommissioned because they are broken, rotted, or otherwise damaged, their mere presence becomes a hazard. Poles leaning over pedestrian walkways are common, as are splintered poles—the remnants of car accidents. Not only do these leaning towers of communication look ominous, they could fall, obstructing sidewalks and damaging property or human life. A car hitting a utility pole is bad enough, but when a car hits two poles packed tightly together, and one is perhaps already structurally damaged, things can get worse. Impact damage compounds with two poles in the way, and the resulting collision can have serious consequences to drivers. And at the same time, cause power and communications outages. Sidewalks are the domain of pedestrians, joggers, dog walkers and any other person hoping to safely traverse their town. It is the one bit of road they can own. Double utility poles, however, have a tendency to get in the way of safe sidewalk travel, blocking walkways and forcing pedestrians to step into streets to go around them. This creates an risky situation for everyone on the road—drivers who must swerve to miss walkers, and walkers who must put life and limb on the line to get from A to B. In the year of the double utility pole, why else might you want to clean up your act—and your community's landscape? Download our top 6 reasons to tackle your double poles today.